Fairy Tale Fandom: The Stuff of Legends: Robin Hood. This is it, folks. The final name on my list of twelve legendary figures and thus my last “The Stuff of Legends”. I wanted to start strong and end strong which is why my first entry in the series was King Arthur and why this one is Robin Hood (going for the crowd pleasers). But if you liked “The Stuff of Legends”, don’t be too sad. It might appear again in the future. Just not necessarily in the same form. Anyway, Robin Hood is probably the most popular folk hero to ever rise out of English legend. 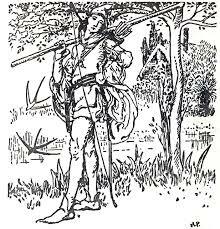 The legend as we know it now concerns a dispossessed English nobleman who takes to Sherwood Forest with a band of outlaws including but not limited to: Little John, Will Scarlet, Alan-a-Dale, Friar Tuck, Arthur-a-Bland, Maid Marian and Much the Miller’s Son. From there they act out in protest of King John’s laws by robbing from the rich and giving to the poor. This puts them in conflict with such agents of the law as The Sherriff of Nottingham and Sir Guy of Gisborne. It’s one of the most famous tales in all the world, having been adapted a million times. But where did it come from and was there actually a real Robin Hood? Well, it seems that whether there was a real Robin Hood or not is a 10 million pound question (we’re using English currency here for consistency), because historians have been looking for that answer for years. Near as anyone can tell, the earliest record of an outlaw being referred to as Robin Hood was actually the case of a man named Robert Hode listed as an outlaw in judicial documents from the years 1225 and 1226. Not much is known about this man other than the fact that he was a debtor who escaped into the greenwood and how much money it took to hunt him down and execute him. Still, there are other candidates for the man who inspired the legend. One is the knight Robert Fitz Odo of Loxley in Warwickshire. Again, there is little evidence to suggest they are one and the same man except the fact that a drawing of Robin Hood’s grave closely resembles a grave in Warwickshire. Another possible inspiration is a young Earl of Huntingdon who was known to rebel against his own father. This is also unsupported by any serious evidence. Making matters more difficult is the fact that the name “Robin Hood” in various forms appears in numerous medieval document as a nickname for any number of outlaws. Whether he was real or not, it’s safe to say his legend has taken a few different forms. His first literary appearance is in the poem “Piers Plowman” by William Langland circa 1377. 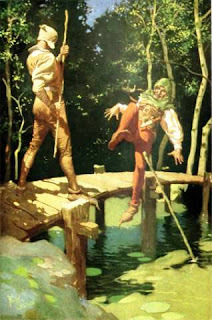 The most common surviving ballads of Robin Hood’s exploits date from about a century later. Many of Robin Hood’s more common aspects such as his archery skill, his partisanship of the lower classes his animosity toward the Sherriff of Nottingham and his associations with Little John and Will Scarlet are all in evidence. However, other elements like the characters of Friar Tuck and Maid Marian are absent. 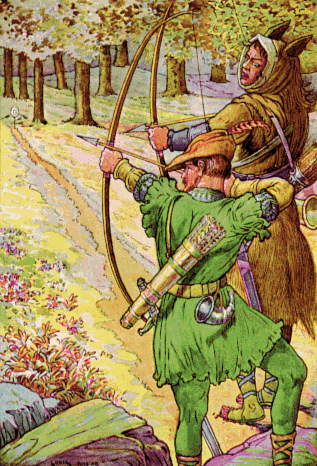 Beyond the ballads, Robin Hood’s legend was furthered by the performance of “Robin Hood games” or plays about Robin Hood that were part of traditional May Day celebrations. It’s here that we see the first appearance of a Maid Marian figure though as a matronly woman who is played by a man in drag and has a romantic association with the “jolly friar”. Later, the character would get conflated with a character from the French pastourelle “Robin and Marian” and become the character we know now. Through much of Robin Hood’s existence he was identified as a yeoman, or a member of the middle class. However, this changed with the plays of Anthony Munday in 1598 who identified his Robin Hood as the Earl of Huntingdon (referenced above) and solidifies his historical position by making him the enemy of King John. And all this is well and good as far as raw information goes. But it does very little to get to the essence and appeal of the legend of Robin Hood. Robin Hood is probably one of the most retold legends of all time. It was transformed into a children’s book by Howard Pyle. It has been made into movies starring the likes of Errol Flynn, Kevin Costner and Russell Crowe. It was one of the few stories that Disney, before 1990 at least, chose to adapt twice. They did it first in 1952 as The Story of Robin Hood and his Merrie Men and again in 1973 with the animated Robin Hood. There have been TV shows like The Adventures of Robin Hood and the more recent BBC Robin Hood series as well as the occasional single episode like this one of Doctor Who. There have also been animated shows like Young Robin Hood and the anime Robin Hood no Daibouken (strangely, both of these shows depict Robin as a teenager). Heck, there’s even been the occasional tabletop game. And I’m just scratching the surface. Don’t believe me? Check out the Wikipedia list. So, why does this specific legend resonate with so many people? Well, I think it has a great deal to do with Robin Hood’s outlaw hero status. The legend speaks to everyone who has felt the need to rebel and also to everyone who’s ever felt downcast, oppressed or downtrodden at any point in their life. It’s a legend that (at least the way it’s told today) suggests that justice will still exist outside the law when the law becomes unjust. And to tell you the truth, neither Robin himself nor England have a monopoly on legendary outlaws. Heck, they don’t even have a monopoly on “stealing from the rich to give to the poor”. In Poland and neighboring regions, there’s a legend of a very Robin Hood-esque character named Juraj Janosik. In Japan, there are legends and many kabuki theater productions about a thief named Ishikawa Goemon who also gave his loot to the poor. Heck, the American West is filled with notorious criminals who have somehow been raised up to legendary hero status. If you believed the early settlers of New Mexico, then you’d think Billy the Kid was some kind of champion of the oppressed rather than the violent, buck-toothed delinquent he was (interesting pop culture note: in the Japanese superhero show Kamen Rider Ghost, the spirits of Robin Hood, Goemon and Billy the Kid all appear as power-ups for the hero). Even in England, Robin’s in good company. From the same time period in English history come two other outlaw heroes Fulk FitzWarin and Eustace the Monk. 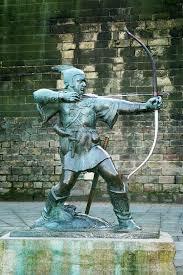 Of course, we also can’t forget Adam Bell, another outlaw archer from English legend. Outlaws are often admired for the sheer gall they have in taking on the established order. But in many cases, the stories of outlaws are embroidered to make them seem more virtuous than they likely were. This is even true with Robin Hood. As late as the 18th Century, there were still works that depicted Robin as more of a notorious criminal than a hero. But despite all the other legendary outlaws out there, something made Robin Hood rise to the top in popularity. I’m not sure I could say what it is. On some level, I imagine the fact that he robs from the rich and gives to the poor really struck a chord with English audiences. Class differences and class struggle have long been undercurrents in English life, politics and literature. At the same time, it might have been the appeal of the colorful cast of characters that rose around him like Little John, Friar Tuck and Will Scarlet. It could have also been something about the time period he’s placed in, a fractious time when the true king was away on a Crusade and the throne was held by another. The legend even managed to travel. In his book Grandfather Tales, Richard Chase includes an Appalachian tale entitled "The Outlaw Boy". The difference in this tale other than location is that Robin learned to shoot a bow and arrow from the local Native Americans. Whichever it is, the legend of Robin Hood doesn’t seem like it’s going away anytime soon. Whatever his secret, Robin Hood is a bad man who makes for a very good story. 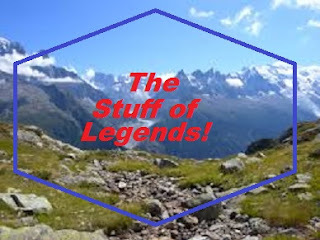 And he most certainly is The STUFF OF LEGEND! What's often forgtten in legends surrounding outlaws is that they were rarely upstanding freedom fighters and far more likely to be egular criminals that plagued the lower classes along with the well to do... but that wouldn't make for very good stories, would it? An example would be the German "Schinderhannes" (actual name Johannes Bickler), who was not, despite what a folksong would make you believe a martyr for "justice and freedom", but a robber and murderer who was hated among his contempoaries. He was only elevated to hero status after his death, when his trial and execution were used as an example of the failings and sometimes outright despotism of the French legal system that was being enforced in the regions of Germany that were under Napoleon's rule. Yeah. I touched on it in the post, but the same thing tended to happen to the outlaws of the American West too. William Bonney aka Billy the Kid was a cattle rustler and mass murderer. Definitely not a good guy. But the Spanish speaking folks of New Mexico latched onto him and transformed him into "El Chivato", a champion of the oppressed who they would sing songs and tell stories about. I believe a similar thing happened to Jesse James. There's actually an episode of the TV show Firefly that deals with that idea in a sort of space western setting. One of the crewmen, Jayne Cobb (a greedy, violent thug himself) turns out to be regarded as a folk hero in the town of Canton all because of a botched heist he pulled that ended up with the town getting all the money. Sometimes, a legend says more about the storyteller and the audience than the main character.